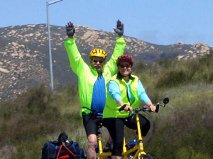 About five years ago, after buying our Bike Friday tandem bicycle, Tom and I decided to sign up for an Adventure Cycling tour called Introduction to Self-contained Bicycle Touring. It was to be held in San Diego in April, and what could be nicer than leaving Alaska in the season of cold muddy breakup? We really looked forward to the break. The tour was to be two days of instruction and discussion and four of riding. There were fourteen of us, and our guide was Alan Detweiler. Great! we thought. Not too strenuous for people coming directly from winter inactivity. How wrong we were. Did you know that it is straight uphill from San Diego anywhere north, south or east? Did you know that it still freezes at 5900 feet in southern California in April? Surprise! Welcome to sunny southern Cal! While still blissfully ignorant of these facts we had a wonderful time getting to know our fellow cyclists and the guide. We all hauled out our camping and cycling gear for some show and tell, and inspected each other’s bikes. Alan introduced us all to Big Agnes camping pads, and that is why I blessed him at the top of this post. 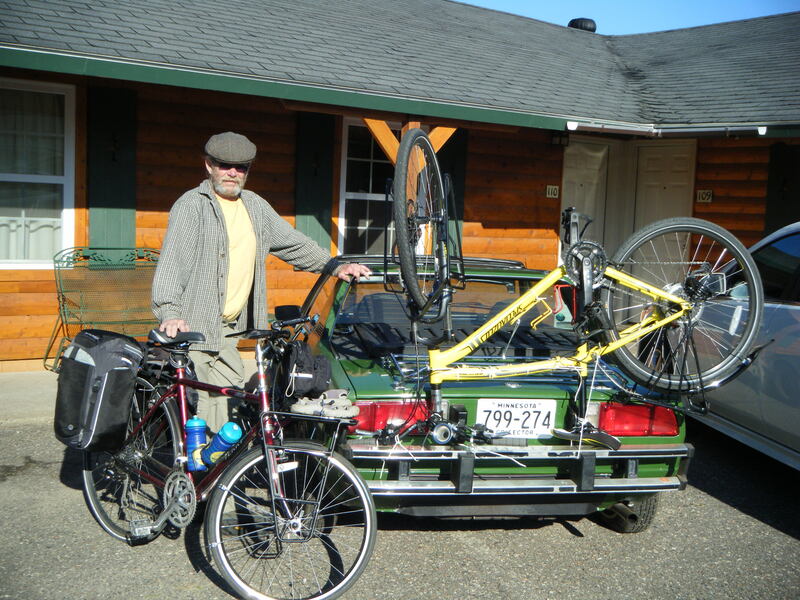 Without that bit of info and subsequent purchase at REI I would not be where I am today–on the road for the long haul. Many years ago, while in my 40s, I had told Tom I was done sleeping on the ground, and if he wanted me to go camping with him we’d sleep in a motel or the Suburban. It was far too hard on the ground, cold, damp and generally a literal pain in the arse. Blessed Alan and Big Agnes changed all that. Sleeping with Big Agnes keeps me warm and comfy! Big Agnes makes a line of camping and backpacking gear that is of the highest quality. I had never heard of the company until Blessed Alan enlightened me. For the San Diego trip we had brought along Tom’s egg carton foam pad and a borrowed Thermarest for me. The Thermarest only reinforced my resolve to never sleep on the ground again, especially when it got to 25 degrees the second night camping at the 5900 foot elevation level. Of course my bag wasn’t warm enough either, and I had on every stitch of clothing I had brought. Not much, and not warm, because we thought we were going to southern California after all! Before we started the cycling I had made a quick trip to REI and bought my sweetie a Big Agnes pad, loving wife that I am. That pad is only 13 ounces in weight and packs into a cylinder 8 inches tall by about four in diameter. Far more practical on the bike than the Thermarest or any other pad I’d ever seen. Needless to say I rousted Tom out on that very cold night and made him change bags/pads with me. After all, he sleeps a lot warmer than I do naturally, and he’s very chivalrous–when I remind him. And in the long run he won out. Our family now has 2 Big Agnes pads, and he has the privilege of my company on camping and hunting trips again. All of this made possible by Big Agnes and Blessed Alan Detweiler, a winning combination. So said Scots poet Robert Burns in 1785, and it is as true today as then. Our best-laid schemes have indeed gone agley. uncomfortable night in a gravel pit about 15 miles north of Palisade Minnesota. We’d accomplished nearly 38 miles that day though, and would ride another 37 in 90 degree temps on the 12th, arriving in Aitkin exhausted. There is the sweetest little 7 site campground there, right on the banks of the river, with electricity and running water–all for only $12! I was getting concerned about Tom. He had not been adjusting to the ride pace as well as either of us expected, and after the third day of improving had reverted to being wheezy, out of breath and struggling with keeping a steady cadence. The following morning he looked so bad and felt so awful that we decided to stay in camp an extra day. We both thought it was probably heat stroke, and as he felt much better that afternoon, decided we would trundle on the next day, Tuesday. However, upon packing up and making our way uptown for breakfast Tom found himself winded and sweating once again. Off to the hospital we went to get his vitals checked. Checked IN is what he got–into the hospital for about 48 hours. The doctor discovered that Tom’s problem was atrial fibrillation, a condition that while not immediately life threatening was serious enough for hospital monitoring, several medications, a ban on alcohol and strenuous activity and an end to his cycling for this trip. But no cloud is without its silver lining. While lounging in his adjustable bed and looking through the local paper, Tom found a 1975 Fiat hard top convertible 2 seater car for a very reasonable price. The owner was kind enough to bring it round to the hospital for inspection. So out goes Tom, hospital gown flapping, kicking tires and looking at the engine in his sock feet. The upshot of it all is that he is now the proud owner of this John Deere green toy-sized car. I’ve discovered that the problem with being too old for a sports car is not attitude so much as altitude–it’s very low, and my knees don’t bend that far any more! I hold strong convictions about humanity that are vindicated again and again, and never so much as recently. Humans are wonderfully kind. The staff at the hospital is paid to care for their patients, but offering to pack the bikes and gear out to the motel I was at is beyond a paycheck. 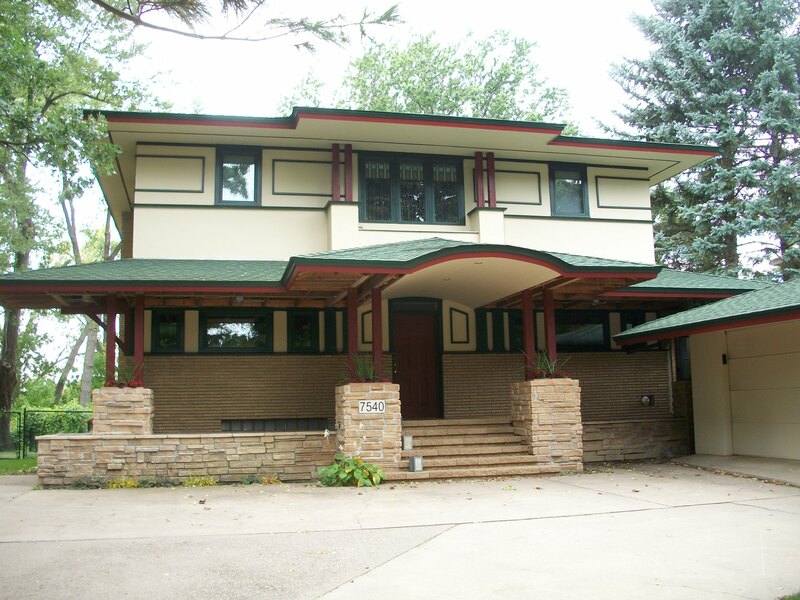 The total stranger who offered his home to us as a place to recuperate, the librarian and fellow cyclist in Aitkin who welcomed us into her home for a fabulous dinner, the owners of the motel who were so kind to me all reinforced my positive take on my fellow human beings. Bless them all. 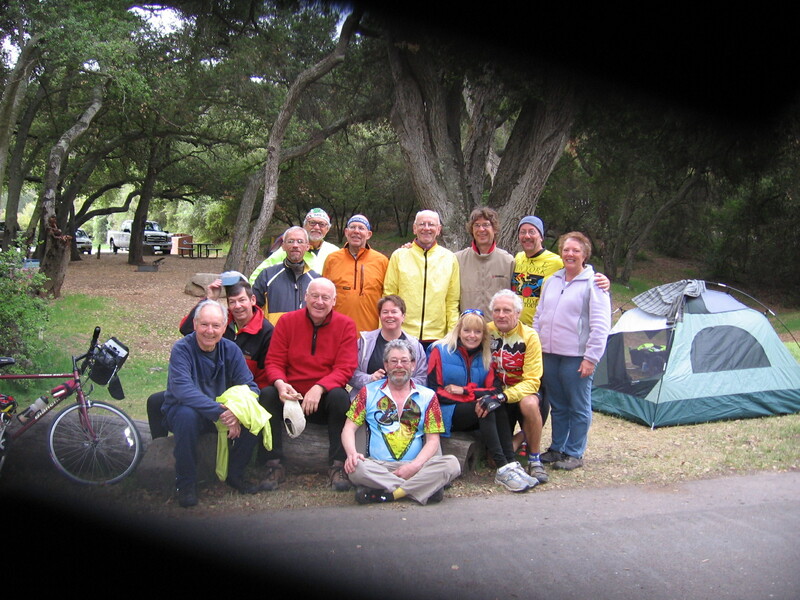 After strapping his yellow bicycle to the bumper and loading the front and back trunks with our panniers we left Aitkin and several new friends behind. That day I turned over 300 miles on my odometer, and now that we are as far as Minneapolis it’s passed 400. I have to confess to feelings of guilt in wanting to continue riding this journey. After all, with Tom unable to ride with me, what really was the point? His health is absolutely more important than any personal accomplishment on my part. We were both terribly disappointed. But when he discovered the Fiat, he was so excited and so eager to be the SAG for my ride he was like a little kid! Here was the perfect way–under the changed circumstances–to meet the goal of the Gulf. cooler temperatures, some rain, some headwinds and a lot of beautiful riding. Our cue sheets have taken us down through small towns and farms as close to the Mississippi as possible while staying on paved roads. However, we have reached that point in the route where we are passing through the much more urban landscapes of Minneapolis and St. Paul. Still the guide does an admirable job of sending us directly along the river, into old upscale neighborhoods, along bike paths and parks within spitting distance of the Mightier Mississippi and cleverly avoiding the industrial zones where things would be bleak and much dirtier. Both of the Twin Cities have made a concerted effort to humanize their landscapes and create greenways and parks in the most scenic parts along the river. In the nineteenth and early twentieth centuries the land along the river was given over to grain mills, lumber operations and railroad yards. Much of that has either moved or failed, and local government has strived to restore prairie and wetland landscapes in order to improve water quality and wildlife habitat. That suits the human spirit’s need for quiet green spaces as well, and the entire web of life benefits. For this and all our blessings, we are grateful. And so we have, amazingly enough. We got to Minneapolis on the evening of the 1st of September in high heat and humidity and immediately wilted. Thank goodness for Jake’s central air! After the mandatory whiskey overload of the first night, we unpacked and reassembled the bikes. In the next couple of days we toodled around Minneapolis running errands, going on a celebratory fun ride to the ice cream store and generally doing the family visit thing. Sunday we caught the Wayne and Jone Classon Express to Itasca where we were treated to a fabulous dinner at the 30s era Lodge by these wonderful friends. They helped us set up camp for the night before it got dark. Soon it would be on the road for us! 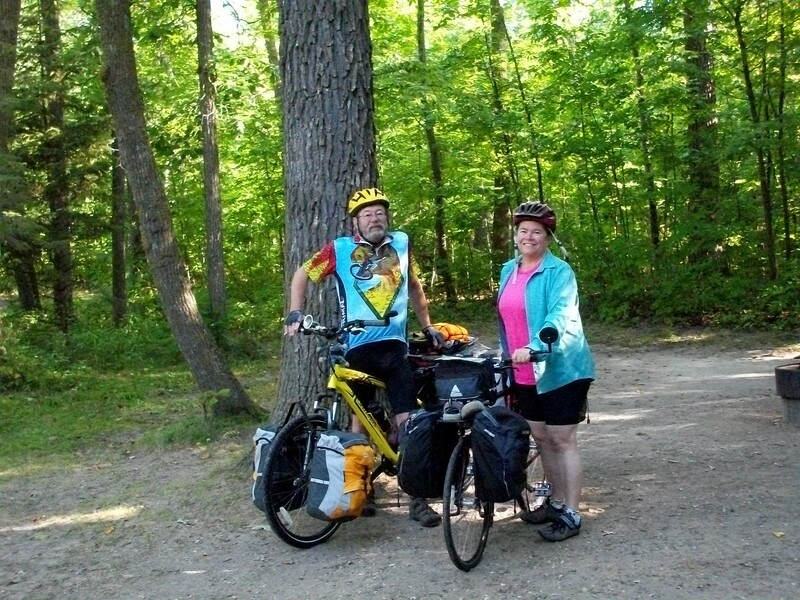 Itasca State Park has beautiful bike paths and a fabulous interpretive center where you can learn everything you ever wanted to know about the Mississippi River and surrounding area. 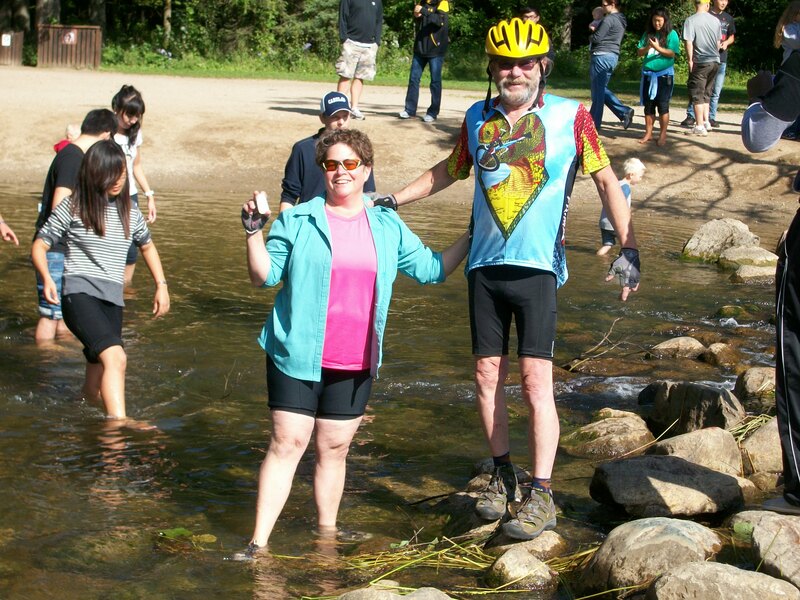 The official Headwaters is visited by more than half a million people a year, and this Labor Day Sunday was no exception. It was crowded with Japanese students, Midwesterners showing the relatives around and European tourists wondering just why France sold the fledgling U.S. this vast territory so cheaply. We, in our bike togs, got no more than a few cursory looks while imposing on strangers to take our photo standing in the Father of Waters. I filled a little vial from the stream, intent on lugging it down to the Gulf where half of it will join the river again. I will refill the container with water from the Gulf and lug that home, TSA willing. Whether that water is very salty or not remains to be seen, as Old Muddy extends its influence far out to sea. After all the obligatory rituals at the headwaters we were off and rolling through the beautiful Minnesota countryside. The area is full of small family-owned resorts, clustered around every lake and on the banks of the river. Deer are everywhere, including flat on the road. This first “shake down” day was good, and we made the 36 miles to Bemidji in time to get into a hotel with a hot tub, which is a blessed relief after a long day in the saddle. We have planned to camp primarily, but the first day is a special situation, don’tcha think? 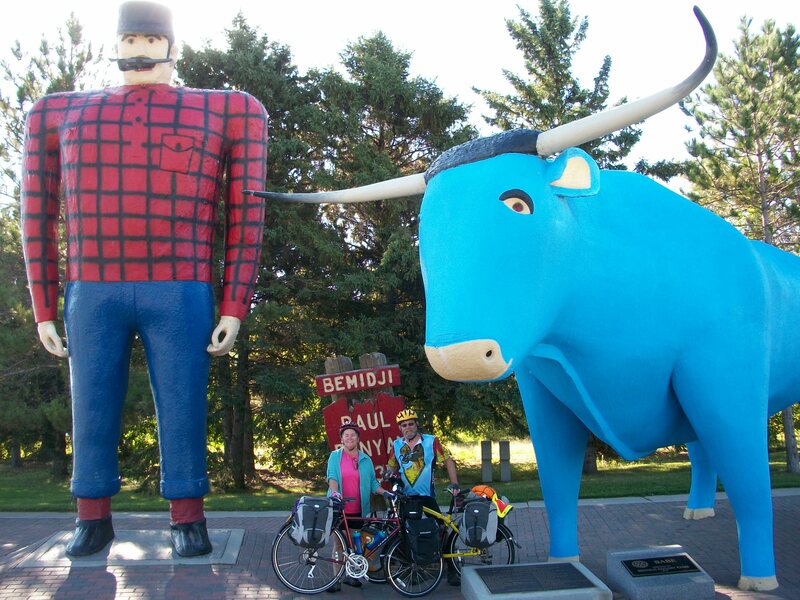 The next day, through town, past the giant Paul Bunyan and Babe at the visitor’s center, saw us take our first detour. One six mile section of the route was torn up and sandy, so we diverted to US Hwy. 2 instead. Getting the gollywobbles on a sandy road while carrying full gear is no way to travel! We caught lunch at Cadillac’s Northstar Grille just before the junction with the highway, outside of Cass Lake. A nicer couple of people than Connie and Larry you couldn’t find–along with the best fish sandwich I’ve ever had. 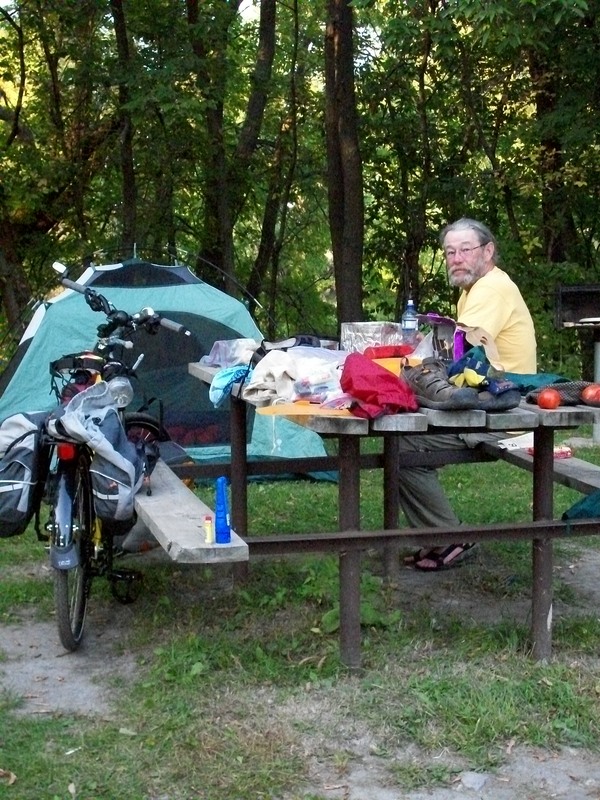 We only put in 29 miles that day, but camped in a lovely and all but deserted place on the lake. Post Labor Day, the campgrounds are empty, which is more than a little eerie! 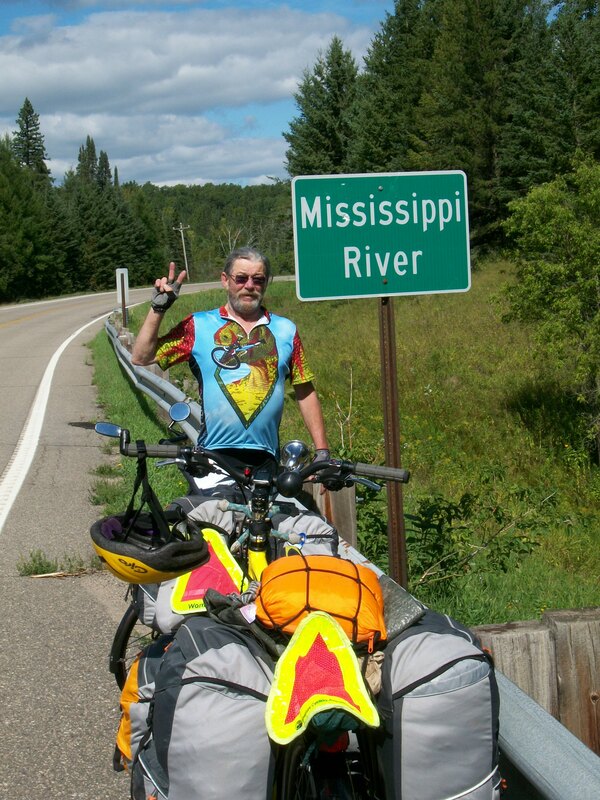 In the first 2 days we crossed the river eight times, and memorialized every one of those crossings with a photo. All along this route we are close to the Mississippi, though often the woods and farm fields shield it from view. The bridges are small, the river narrow and fast flowing, very clear here in the upper reaches. So different from the river I knew as a child in LaCrosse Wisconsin. The third night we camped at the Lake Winibigoshish Dam campground, and the first thing we did was to don bathing suits and go plunge into the water. Brrr!! Still cold at this far northern reach, and so refreshing after 37 miles in 80 degree heat! On Thursday we passed many houses with huge gardens of corn, squash, pumpkins, beans and tomatoes. Finally, I couldn’t stand it any more. I was determined to stop at the next place and purchase fresh corn and tomatoes if it killed me. And it nearly did–I go wheeling into the very sandy driveway, forget I’m clipped into my pedals and take a header off the bike. One bloody elbow and red face later, I walked away with six ears of corn and almost a dozen tomatoes. 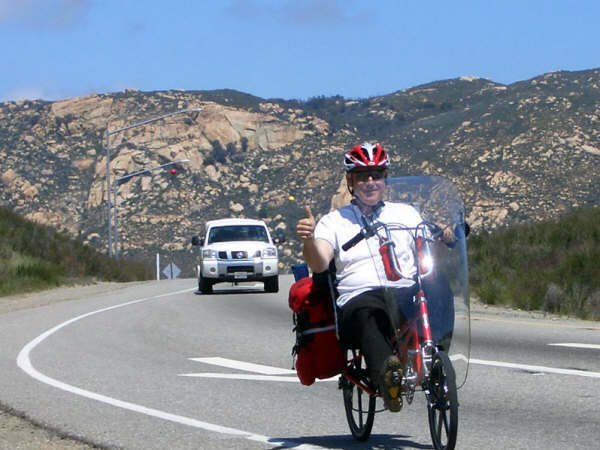 I had to stop the gentleman from giving me more–I had no more room in the panniers! Friday we took a down day in Grand Rapids in order to get work done on the bikes (thank you Dave at Itasca Bike and Ski! ), do laundry, eat corn til it came out our ears and feast on tomatoes. Since the Packers were playing we had to stay in a hotel–watch the game, don’tcha know! Coming out of Grand Rapids I was arrested by a life-sized pink baby elephant standing in the yard of a rundown little bungalow. Aunt Sally, I was thinking of you and got a picture! What is it with the Heartland and giant replicas of folk heroes or wildlife? 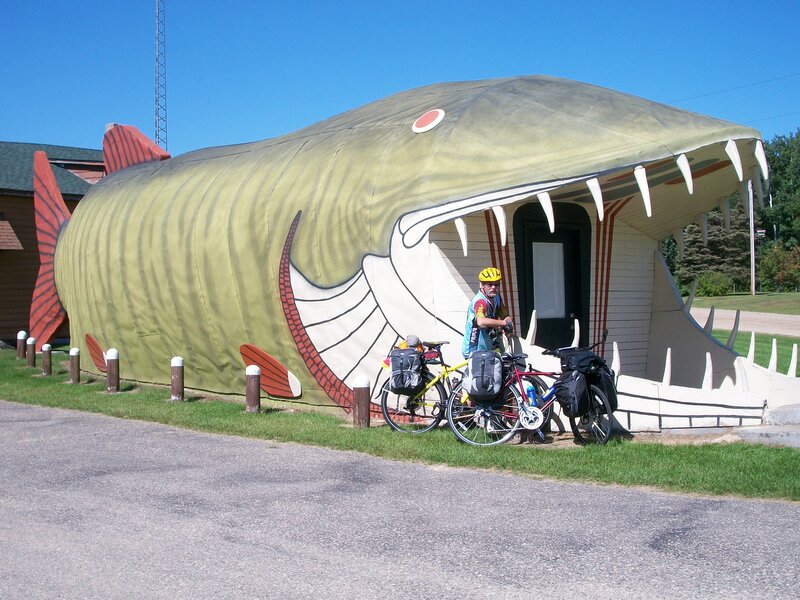 Not too much further on we came across the Big Fish Supper Club, where there is a huge Walleye Pike by the side of the road that serves as a cabin. You enter through the gaping mouth full of long sharp teeth! Shades of the biblical Jonah! My, what long sharp teeth you have! I have been very impressed with the Minnesota roads. Studded tires are banned here, and it shows in the condition of the road surface. How they do this with all the ice and snow they get is beyond me, but apparently having no mountains helps the situation! All the roads we have traveled are smooth, have wide shoulders and almost no litter alongside them. The little communities scattered along the way are very proud of themselves, and individuals seem to really care about the state of their state. Ambling along as we are, we have had no close encounters or even an irritated honk in all 237 miles. Every driver has given us wide berth and friendly smiles, even on the major highways. As an Alaskan, I am truly grateful. It may be a bit more problematic to update this blog than I anticipated, when I decided to go without smart phone or portable computer. The towns are further between than I thought (we’re going slower) and it takes me much longer to post than I thought it would too. Perhaps with more practice, both cycling and posting, the time I have to spend doing it will improve. Til next time then, see ya down the road!